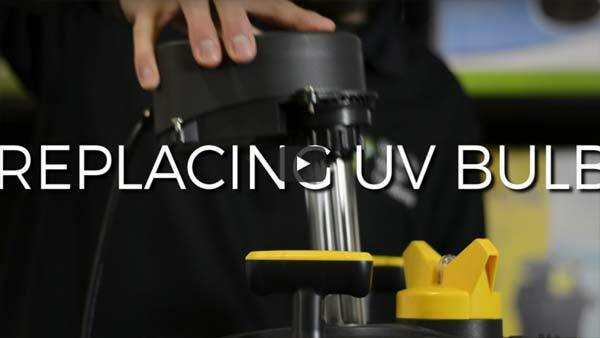 How To: Replace UV Bulb in a Laguna Pressure-Flo UV bulbs generally have a lifespan around 12 months of continuous use and should be replaced accordingly. UV bulbs generally have a lifespan around 12 months of continuous use and should be replaced accordingly. Obviously, if you're climate forces you to winterize the unit, and you're only running it 7, 8, 9 months a year, take that into consideration. Before getting started, make sure both the pump and filter are unplugged. Using a Philips head screwdriver, unscrew the 4 screws that fasten the transformer head to the filter lid. Go ahead and set the transformer down. To access the bulb, we need to first remove the quartz sleeve. To do so, remove the security screw on the retaining flange. Once the retaining flange is off, pull the quartz sleeve and the o-rings up by exerting a slight rotary movement. Grip the white part of the UV bulb and pull it free from the socket. Take the new and replace the bulb in the reverse order it was removed. Note, when replacing try to use rubber gloves if you have them. This will eliminate the transfer of oil from your hands to bulb, which can lead to bulb failure. For more information on this procedure or bulb replacement on another filter - please don't hesitate to call. Today I'm going to show you how to replace the foam filters in your Laguna Pressure-Flo Filter. The Laguna Pressure-Flo is a sealed pressurized filter. The installed O-rings provide water tight seals in 4 locations.